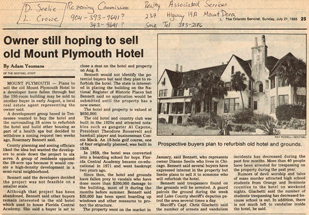 Florida Central Academy occupied the building and grounds of the 150 room Mount Plymouth Hotel, located in Lake County, Florida. Finished in 1926 at a cost of $350,000.00, the building was the centerpiece of a golfing resort. These are very early pictures of the Hotel. 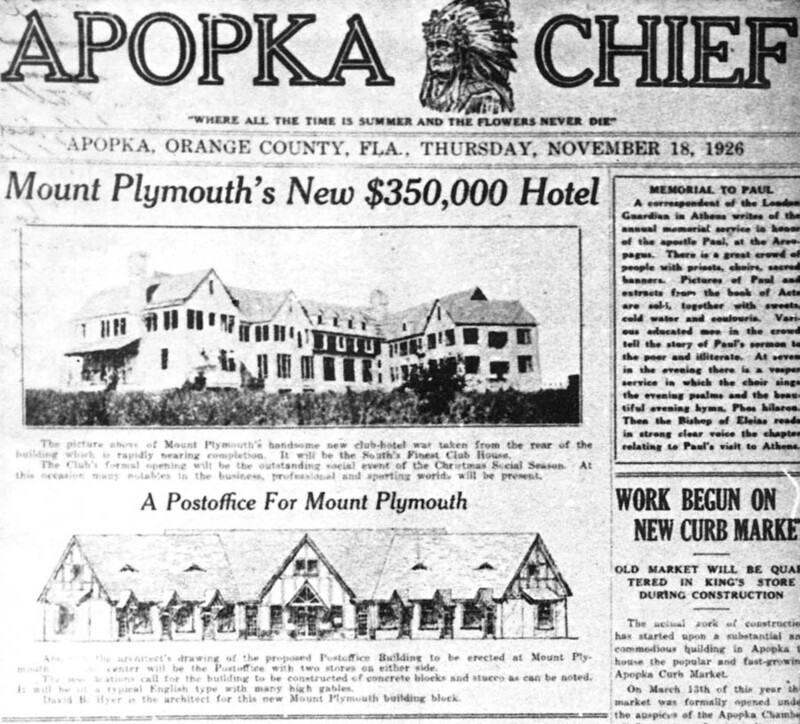 The article above is from the Apopka Chief from 1926 right before completion. Click on Article above to see bigger picture. The picture above shows the hotel without the extension built. 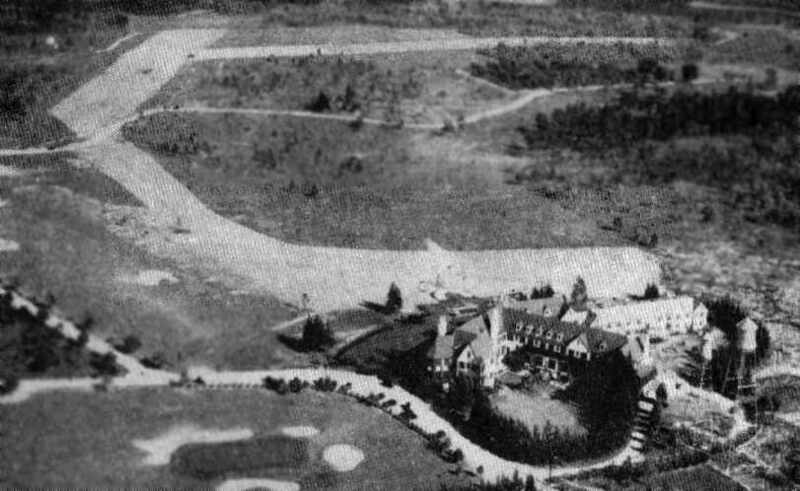 The 18 hole golf course, one of four originally planned, was patterned after the St. Andrews course in Scotland. 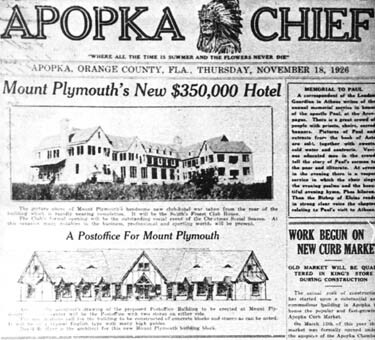 Although the Florida real estate crash of 1926 kept the other three courses from being built, the hotel became a center of activity in the area and was a winter golfing retreat for the famous and infamous. Al Capone, Connie Mack, Babe Ruth, and singer Kate Smith were among the hotel's guests. Capone was reported to have brought his girlfriends to the hotel. He and several New York and Chicago gangsters were believed to have used it as a hideaway. 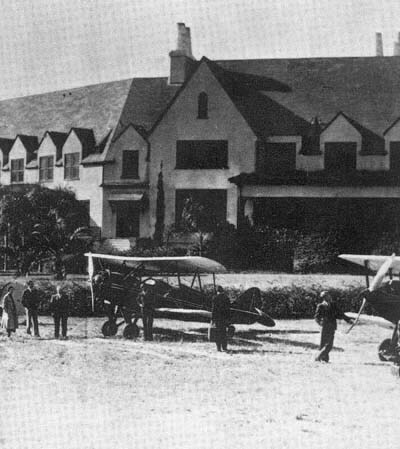 Aviation was the way that people got to the Mt Plymouth Hotel from within Florida and from out of state. 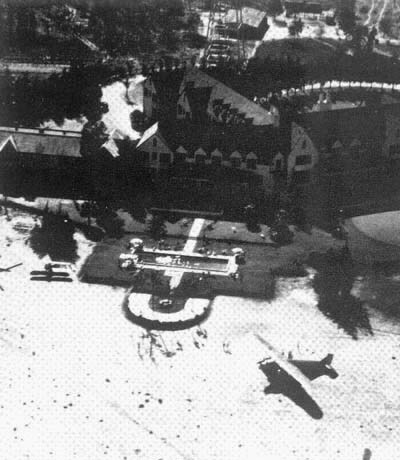 The aircraft were mostly privately owned and were flown into the resort. There was a stagecoach that operated from Sanford we are looking for pictures of that form of transportation. This is a very rare key ring / tab from the Mt. Plymouth Hotel. Click on the picture for a bigger view. The school operated from 1959 until June of 1983. 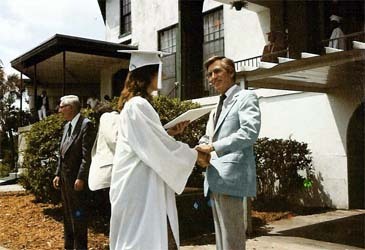 Originally a boy's school, the Academy opened its doors to girls in 1971. Classes in grades 7-12 were offered, and students from around the world attended. The school also accepted 'day students' from the local area. In it's heyday, it was considered one of the finest college preparatory boarding schools in the United States. In May of 1983, the last class of 20 seniors graduated. On June 8, 1983, the property became the custody of the U.S. Bankruptcy Court. A federal bankruptcy judge ordered the school closed and all business transactions halted pending the settling of claims from more than 330 of the school's creditors. Four days later county health officials condemned the building as unfit for human habitation. The building quickly fell prey to vandals. Plumbing was ripped out, walls bashed in, windows broken and graffiti painted on the walls. At 3:20 pm on January 6, 1986, the Mount Plymouth Fire Department. received a phone call informing them that the 'empty school' was on fire. Mount Plymouth firefighter Catherine Davis, first on the scene, said "If we only had a few other people out here, we might have saved it." The two water towers behind the building had been empty, so firefighters were forced to truck water from a mobile home park two miles away. Forestry Service firefighters used a bulldozer to plow a fire line around the building. Hundreds of people from the surrounding area came to watch the fire. The smoke from the blaze could be seen as far away as Sanford and Orlando, and by nightfall the tiny community of Mount Plymouth was capped with a glow of orange. It took two days to put the fire out. On January 7, three teenage boys admitted to investigators that they had set fire to the run down and empty building the day before. Two three story wings were destroyed. The two story south wing was saved, though heavily damaged. The building owner, Dianne Seelie, a Chicago real estate broker, said she would have the rest of the building torn down. Her parents bought the structure in 1959 and leased it to the Academy. She had put the property on the market in 1985 with an asking price of $650,000. "I've had so many people call me and express their regrets over what happened. It's a great loss to the community," Seelie said to the Orlando Sentinel. 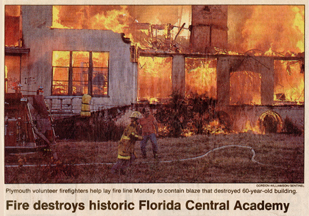 The above photo, from the January 7, 1986, Orlando Sentinel, shows firefighters in front of the blazing Allen Hall. The three windows of the 'TV area' in the lobby can be seen on the left, and the arch that lead down to the Grill can be seen burning on the far right. The brick shaft of the main lobby fireplace (the 'Hearth') can be seen rising out of the center of the fire at the top of the photo. 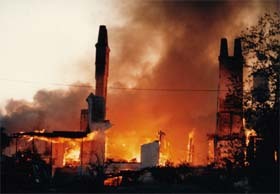 One year later, on Saturday, January 3, 1987, fire destroyed the South Wing. Authorities suspected arson. The abandoned two-story, 200-foot- long wing had survived the spectacular blaze that destroyed the rest the building on January 6, 1986. Firefighters were called out about 2:30 a.m. They found the entire South Wing attic in flames, so they concentrated on protecting surrounding homes and buildings. Firefighters from Orange County and Apopka assisted volunteers from several fire departments in northeast Lake County. State forestry workers plowed a fire line around the building, a tactic of containing the blaze that was also employed during the original fire in 1986. By morning, the entire South Wing had burnt to the ground. All that remained of the school were the out buildings, including the library, gym, classrooms, 300 building, faculty housing and the empty water towers, all of which had sustained heavy vandalism. Jude Rodrigues, class of 1982, sent in this July 21, 1985 Orlando Sentinel article. Click on the image for a larger version. Jude writes: "Here is an article on the abandoned school building with possible items on who would purchase it. There was a sign up at the property for years with telephone numbers (hand written on top of paper) that were posted. I guess finally the golf course purchased much of what was left after the fire and took the class rooms and converted them to duplexes." For more information, we recommend that you visit Fritz Feuerbacher's excellent web site devoted to the hotel's history. 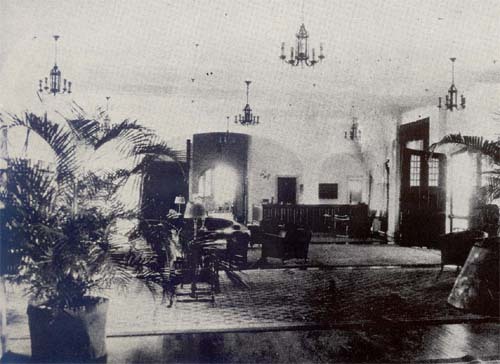 Included are documents related to the hotel and school, and photos of the building before and after fire gutted it in 1986. Fritz writes..."Hello FCA Alumni. I have created a message board available from my FCA web page. Its only in its rudimentary stages and I will be improving it as time allows. If anyone of you would like me to post something on the page I would be happy to. Many of you have asked why I am interested in FCA. Well, I am from the Orlando area so it has certain historical aspects that I like. I also liked going to that building because it was like stepping into a time capsule. What comes to mind is the saying "If walls could talk". That place existed at a point in time just when central Florida was transitioning from the old Florida, unspoiled and pure, to the overcrowded, urban sprawled, traffic jammed, water rationing mess that it is today. So you see, even someone that didn't attend that school as a student can relate to the place." Colonel Allen and General Alexander founded Florida Central Academy in 1959. 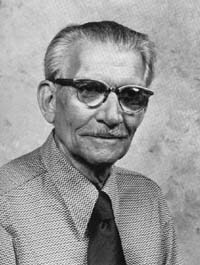 Leroy Edwin Allen was born December 15, 1909, in Greenup, Ill. He graduated from the University of Illinois (Chicago) in 19 (?). Roy Allen served as a executive of the Boy Scouts of America from 1935-40. From 1940-45 he was National Youth Director in the Champaign-Urbana area of Illinois. From 1946-49 he was director of admissions and public relations at Howe Military Academy. 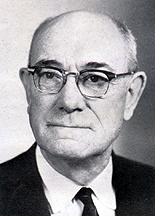 After leaving Howe, he became director of Limberlost and Stonycroft Camps from 1949-52. Then, in late 1952, he joined the staff of Riverside Military Academy as director of admissions and assistant commandant. He was also varsity basketball coach at Riverside. Upon founding FCA, Allen said to Gen. Alexander, "You are the General, I'll be the Colonel." The nickname stuck with him for the rest of his life. He died January 18, 1979, in Waterman Memorial Hospital following a short illness. He was 69. General T. L. Alexander was a United States military general and was active in the China Theatre under the Marshall plan. His son, T. L. Alexander, Jr., was at the Pentagon until at least the mid 70s and was a good friend of FCA. 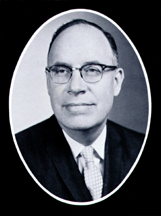 The General co-founded FCA along with Colonel Allen in 1959, and he served as Superintendent of FCA from 1959 until 1970. He and his wife, Wrennie, retired to Camden, South Carolina, the next year. General Alexander passed away in 1976. Kenneth Henry visited the Mt. Plymouth Hotel and Country Club in the late 50's. He advised Colonel Allen and Colonel Alexander that the hotel was up for lease. Soon after the building became Florida Central Academy. Mr. Henry worked through the years founding many of the literary publications. He produced the second yearbook, and started the first newspaper The Trident. A magazine was also produced called The Epilogue. "Uncle Kenn" as he was called kept up with sponsoring the yearbook and magazines. He produced his last yearbook in 1981 and passed away. The 1981 yearbook at F.C.A. was dedicated to him. We will always remember him as a friend, educator, scholar, and gentleman. And our school so fair. While the years roll on. This image of the hotel is from a postcard from the 1950s. The postcard was sent to us by Clayton Scott, class of 1961. Click on the image to see a larger version, along with a detail from the back of the postcard showing how the newly established school converted hotel postcards into school postcards. here for photos and stories. and the spelling of people's names. If you see any mistakes, please let us know!